I'll be on vacation 'til next Wednesday. Going to Seattle for a friend's wedding. Here are 2 topics to think about and discuss amongst yourselves 'til we meet again. 1) What SHOULD the role of the federal government be? Do not let it's current role sway you. Try to start from scratch. By golly, read the constitution if you have to. Then, in the most basic form you can, share your thoughts. 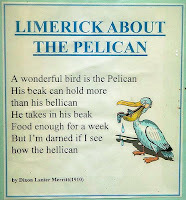 2) Complete the following limerick, in a PG fashion. so under her arm she did tuck it. Who carried her robe in a bucket. "And it shrunk, so I'm going to chuck it." Wow! I am more than impressed. This makes it actually difficult to award a winner. But, this is why you hired me. To make the tough calls.